In process study at Lebanon Hills Regional Park - restored prairie. My landscape painting process is site specific and guided by my relationship with place. I start by making plein air studies, primarily of Lebanon Hills Regional Park in Dakota County, MN. This park is about 2000 acres and features bogs, sedge meadows, oak savannas, ponds and other wetlands. 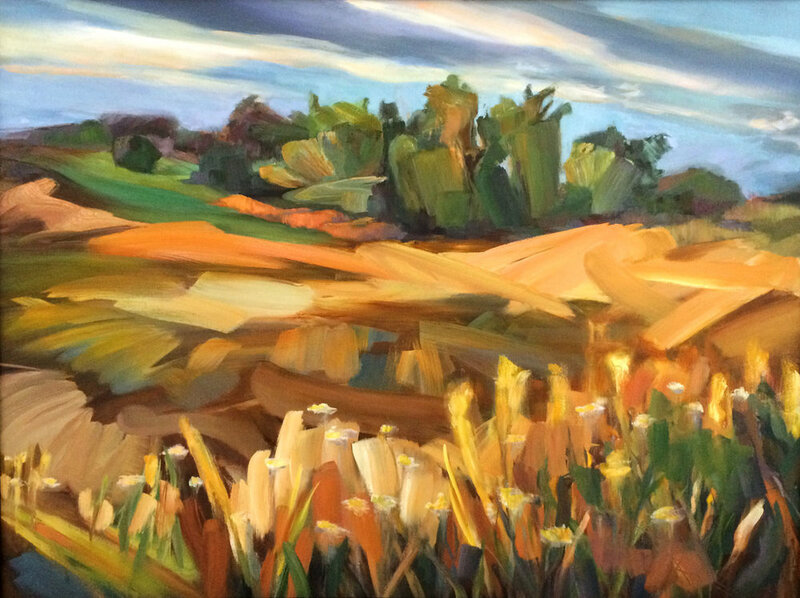 I have painted in and around this location for about 15 years years and appreciate the unique hilly topography and variation in ecological zones, from wetland to woodland to restored prairie. I grew up on the border of the park, so it is special to me because I have spent my whole life exploring this place. My great-grandparents lived, farmed and kept bees here. Their farmstead was sold in the mid 20th century and became part of the park. A particular location I have been visiting recently is a section of the park on the eastern end where Dakota County partnered with Great River Greening to restore 75 acres of oak and savanna. 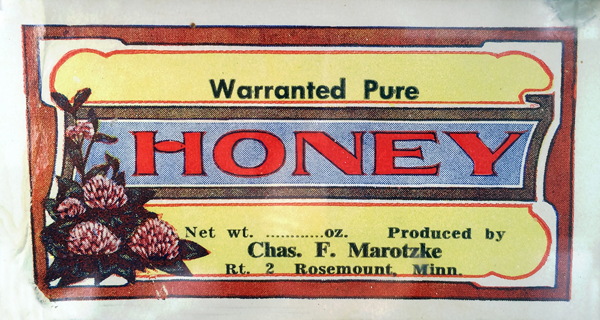 A label from one of Charles Marotzke's jars of honey. My great-grandfather, Charles Marotzke, once had a farm near what is now a storage facility for maintenance vehicles in the park. He raised seasonal crops, cucumbers for pickles and had honeybees. He created a bee-cave in the park that still exists. I usually prioritize painting smaller scale plein air work during the warmer months, and move into my studio during the colder months. There are times when I will make large paintings directly on site, but typically using the Minnesota winter as studio time has been an aspect of my practice. 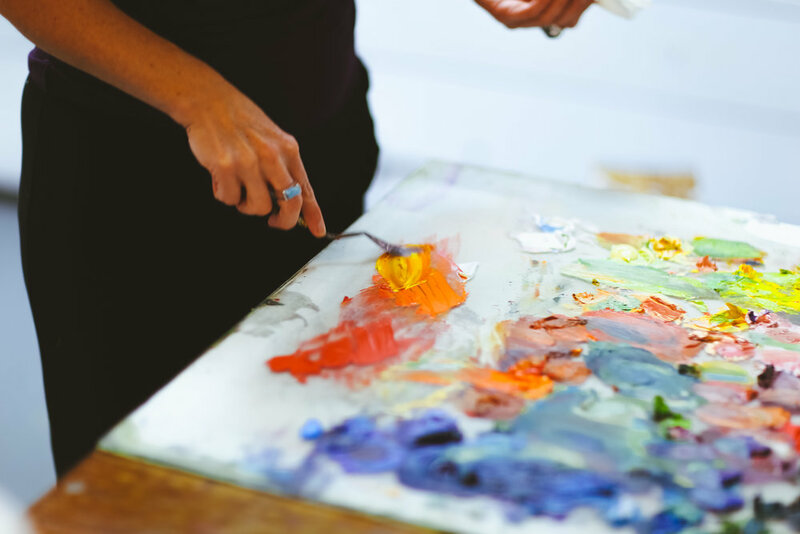 Mixing paint on my palette - I use a large piece of glass on a table, backed with white or grey paper. I see the smaller scale studies as explorations, note-taking and ideas which become the larger pieces. I strive for authenticity to the spirit of the original study, without the larger piece becoming a stale copy. A lot of my painting language is about movement and markmaking, so this takes precedence in the larger work. Many changes, large and small, happen during this exchange, so often the resulting larger work looks different than the study. 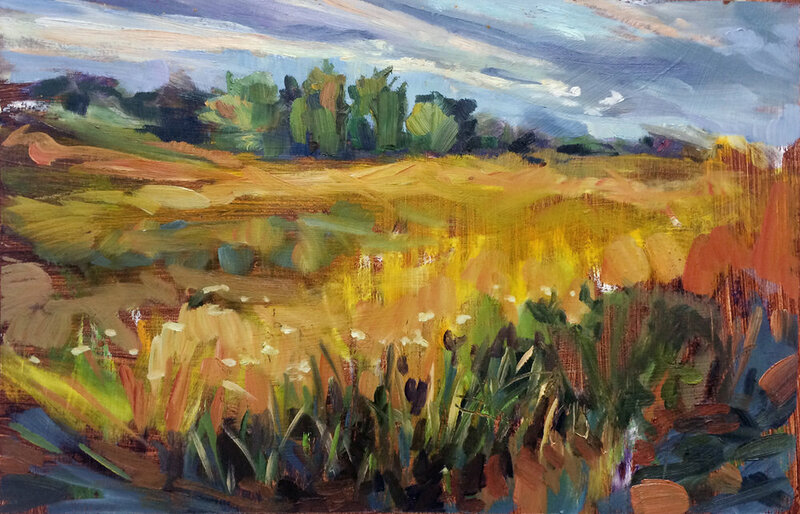 Restored Prairie plein air study. Using the study (see first image and above) as a reference, I painted this 30" X 40" oil on canvas landscape in 2017 for my two-person show (with artist Susan Solomon) Heart of a Place at Banfill-Locke Center for the Arts in Fridley, MN. My goal was to capture the color and energy of the study, but to work larger and more gesturally with bigger brushes. I wanted to evoke a sense of change, changing color, changing energy and changing seasons, with the painting.